There’s something different about the island in the middle of Lake Taylor. Usually empty except for a wooden stable, the island now has figurines on it, including a baby. Baby Jesus, to be exact. He rests in a manger as Mary peers down at him, her hand drawn to her chest. Nearby, Joseph admires the boy, and wise men look on with gifts in their hands. There are sheep, a camel, a lamb and a few other onlookers. Every holiday season, travelers who drive along Kempsville Road near Lake Taylor Middle School are greeted by the figurines, glowing in the night. 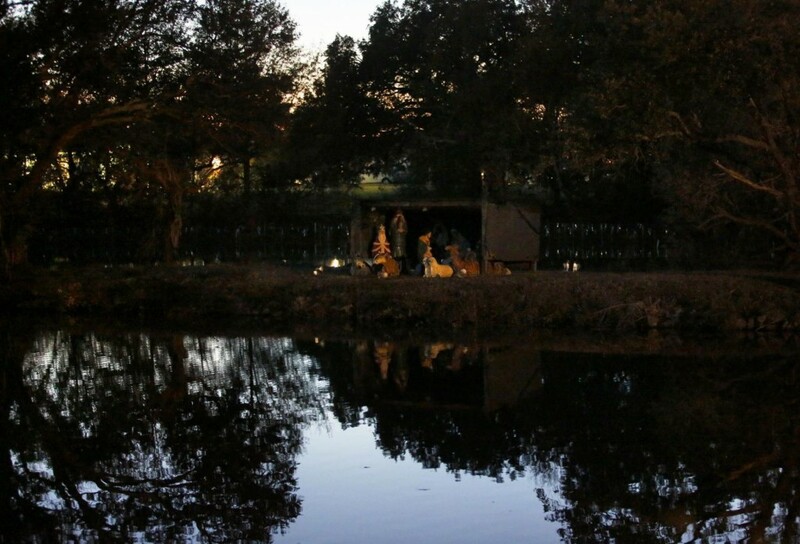 Not yet lit up for the season, the nativity scene in the center of Lake Taylor as seen during twilight Wednesday, November 21, 2018. Photo by Stephen M. Katz/Pilot Staff. Some residents remember the scene fondly from when they were kids and look forward to it every year. Charla Smith-Worley has lived in the Lake Terrace neighborhood since 1951. Now treasurer of the Lake Taylor Civic League, her family drove by the nativity scene many times on the way to their family farm. “When you’re out here in what we called the country, it was a very bright spot to see over the years,” Smith-Worley said. She thinks the display adds a nice touch to the area.”It’s a good entrance way to our neighborhood,” she said. Today, the environmental services and maintenance departments at Lake Taylor Transitional Care Hospital set up the scene, said Kim Limbaugh, a hospital spokeswoman. “They get in the row boat and they row them (the figurines) out,” she laughed. The team rowed Baby Jesus to the island on Nov. 19, but the lights won’t turn on until this week, she said. The scene has been part of Hampton Roads history for quite some time. While it’s uncertain exactly when the tradition started, there are reports that it dates to the 1930s. According to a 1947 report from The Pilot, Charles Hunt, then superintendent at the Norfolk Municipal Hospital, was inspired by a Christmas card and decided to decorate the island. The hospital’s maintenance superintendent, James Dunbar, put up the lights. Dunbar loaded patients into his car and took them to see the decorations at night, the report said. Eventually, they added two life-sized sheep, a realistic donkey and a wooden stable that Dunbar made with his maintenance crew and inmates from the City Prison Farm. It took them a month to make the stable. At some point in the 1950s, city officials decided to stop the scene, possibly because of a fire that destroyed much of the original display. But residents objected and they changed their minds, The Pilot reported. Harry Frizzell, 82, lives in the neighborhood and remembers hearing about the fire. “I was really surprised that they put it back together,” he said. Over the years, the hospital’s volunteer auxiliary has bought replacement figurines to keep the tradition going, Limbaugh said. The island will also have a menorah to celebrate Hanukkah. She said the decorations are part of the area’s history. 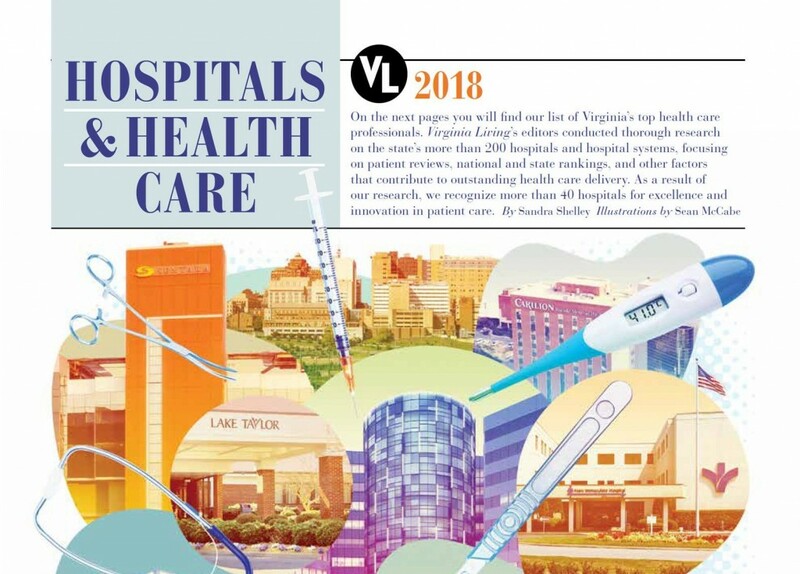 Lake Taylor Transitional Care Hospital will be featured in the December issue of Virginia Living Magazine for “Top Hospitals & Healthcare”! Passy-Muir valve restores speech to young patient at Lake Taylor Transitional Care Hospital. All but immobilized, the 22-year-old Navy sonar technician was admitted to Portsmouth Naval Hospital, where doctors finally zeroed in on her mysterious ailment: Guillain-Barre syndrome, a rare disorder in which the body’s immune system attacks the nerves—the same affliction that Dallas Cowboys’ center Travis Frederick is now battling. The disease is characterized by rapid onset muscle weakness and tingling. 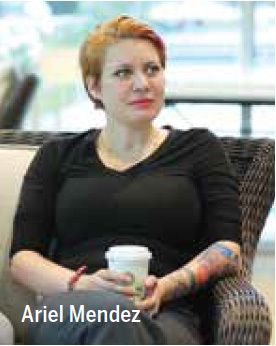 Mendez spent eight weeks in the ICU, undergoing a tracheotomy so she could breathe with the assistance of a ventilator, with feedings through a PEG tube in her side. Unable to move or talk, “I was kind of stuck in my own little box, where I couldn’t tell people how I felt. I couldn’t tell people, ‘I’m in pain.’ I could just make little noises and widen my eyes.” As a person who values her independence, she found reliance on others difficult. 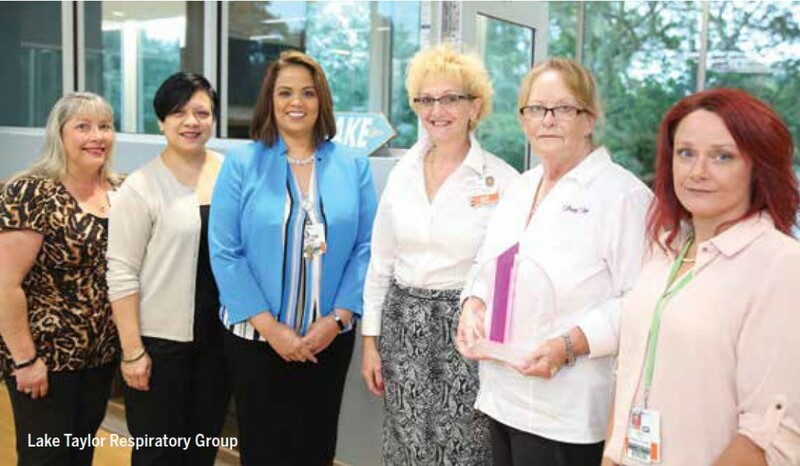 In September 2017, the long-term subacute hospital was recognized as a Center of Excellence by the makers of the Passy-Muir valve—one of only 14 such centers in the world. 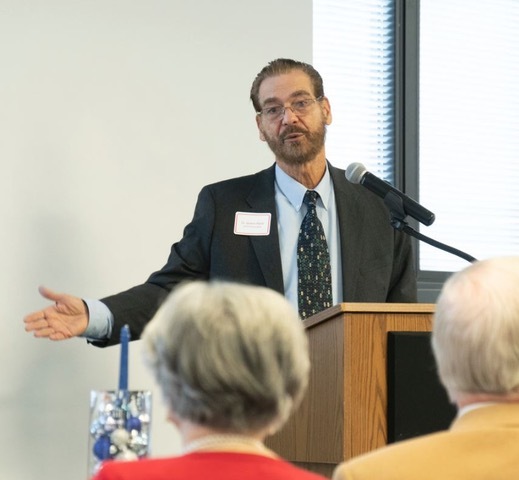 “The Passy-Muir is our best option because generally patients do not have any increased work of breathing while they’re using the valve,” says Mil-lie Zanders, the hospital’s director of respiratory. 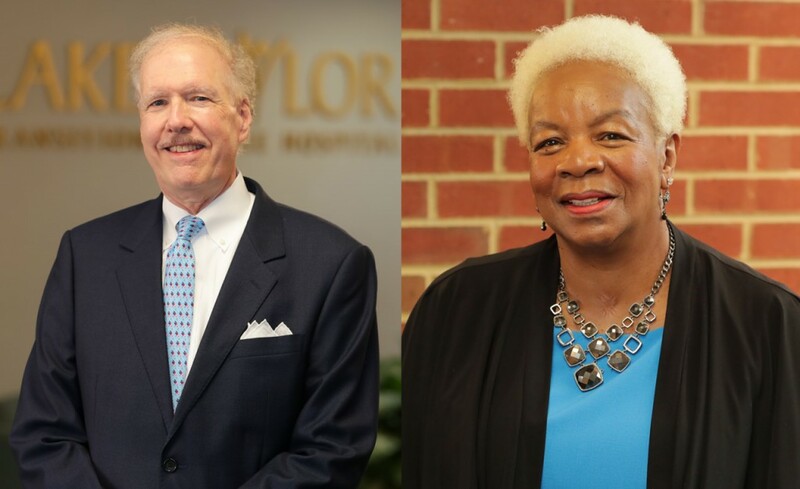 With about 50-60 ventilator and 14 trach collar patients on any given day, Lake Taylor “is one of the largest trach/ventilator-devoted facilities in this area.” The staff is committed to improving the quality of life for its patients through state-of-the-art technologies. In September, the facility acquired seven Ventec VOSCN Ventilators, a combination ventilator, nebulizer, oxygen concentrator, cough assist, and suction machine. It’s one small box “instead of 10-15 machines,” says Zander, and will allow the facility to take ventilator patients on outings. Lake Taylor’s recent Recreation Room Addition project was awarded an Honorable Mention from the IIDA for Interior Design Awards, Virginia\West Virginia Chapter. Joseph H. Trost, principal and CEO, PF&A DESIGN of Norfolk, the design architects for the project, submitted the project into the competition and shared the good news with Mr. Orsini on Oct. 8. A framed certificate was presented to Lake Taylor at the Norfolk Hospital Authority 30th Anniversary event on Oct. 16, and will be displayed for all employees, patients and families to enjoy. Congratulations to the entire team — LTH Administration, Plant Maintenance and Recreation departments, Sussex Development and PF&A — for this impressive recognition!